With 50+ years of riding, training, horse care and lessons, we’ve got some answers to those horse questions. A: There are many reasons for horse accidents, often due to situations beyond your control (something startling a horse, someone else being out of control, etc.) That’s why I teach Centered Riding and talk so much about balance, always having your fingers closed around the reins, long arms and heels down. A balanced rider whose heels are down has a better chance of staying on top of a horse if something unexpected happens. It also helps to understand the differences between predator (us) and prey animals (horses, deer, goats, sheep….) and our perceptions. If you want to ride, we’ll ride. If you feel out of control, or just want some help until you gain confidence, I can put you on a lead line so your horse does everything mine does. Being open and honest is very helpful. Horses are a wonderful help to work through fears. They make us stronger and more aware in many ways. Q: My child is 6, loves horses and did well at horse camp, can she ride horses with us? A: It depends. Children are small. Horses are big. The horses can tell that. Horses have tiny brains that generally react by running away from things that startle them, or – if they know they can get away with it – doing whatever they’re in the mood to do, which is, with mine, graze. 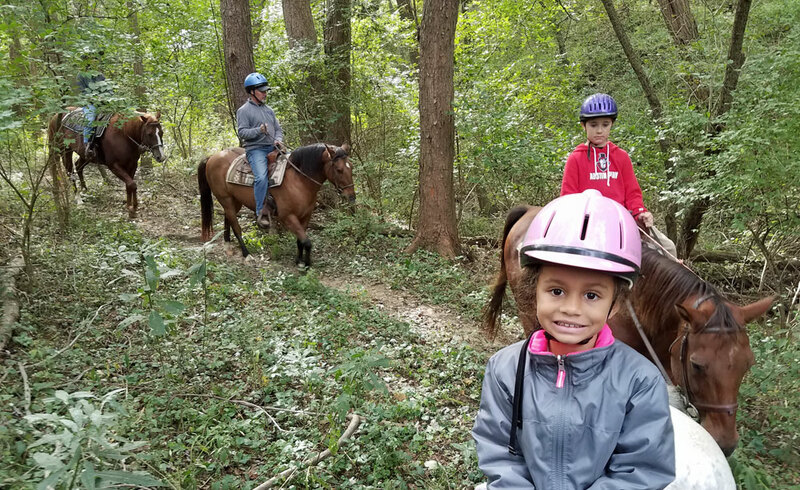 Many horse camps are loads of fun – making stick horses to race, coloring horses, playing games, pretending to be horses, having snacks, water fights, braiding…. Few do much hands-on interaction with horses. That generally requires one on one with an instructor standing next to the tiny person to keep them safe, focused and working. Most horse camps rely on teenage supervisors whose interest is having fun. Consequently, lots of fun is had, practical learning is limited. The Certified Horsemanship Association, of which Jen was a member early in its founding, recommends only allowing children over the age of 5 to ride. Before that, a child’s head is disproportionately large in relation to the body, making it difficult to balance. Riding is balance in motion and requires more muscles than any other sport. Yes, people still put toddlers on horses and some become great riders. I did too (before I knew better), but will not take that risk with your child. Yes, I will allow an extremely focused 6-year-old — with parents who understand the risks — to join us on a lead-line. If he or she is capable of riding without the lead-line, it can be removed, or removed and reinstated. Safety is first. Always. No accidents is my goal. Q: I’m an experienced rider, but my friend is a beginner, is afraid, has never ridden. How will that work? A: After you demonstrate your skills and show you can control your horse thoughtfully, assertively and kindly, you will get directions to increase your speed, try a more advanced skill or do whatever you’ve expressed that you’d like to do. Meanwhile, I’ll work with the newbie, building his or her confidence and teaching basic skills. Sometimes those willing to “go along” become great riders quickly. Other times, they stay on a lead line the entire ride. Simply being honest and upfront with your feelings and goals is a great help. I don’t discriminate or judge. I once had a 64-year-old retired marine on a lead line for an entire riding lesson. By his third lesson he was cantering! A: Are you in for an education! Ask a question and the answers are endless! With 20 years of experience, research, reading and attending seminars, we can talk fencing and shelter options, feeds and hay, supplements, worming, selecting a vet, vaccinations, emergency vet kit, tack choices, saddle fit, bits and bridles, breeds, gender, horse rescue, websites…. Cut me off when you’re overloaded. So many horses change hands rapidly because new owners don’t understand the complexity of horse ownership. My goal is for all horses and riders to he safer, happier, and live better lives after visiting First Farm Inn. Q: What do you consider an experienced rider? A: While I rode and owned horses for 30+ years before starting First Farm Inn, I didn’t know what I didn’t know. Yes, I could ride just about any horse, over just about anything, just about anywhere, in any kind of tack or without any. But what I didn’t know now astounds me since I’ve spent two decades making it my business to know. An experienced rider understands how horses think, the difference between human and prey animal reactions, the importance of balance to both horse and rider, how to sit the trot, how to cue a canter lead and that riding isn’t about jerking on a horse’s mouth. Yes, I know how to sidepass or leg yield, what a diagonal is, what collection means, etc. I don’t consider that a requirement, but it certainly indicates you are an experienced rider eager to communicate safely and correctly with a horse. I’ve won a few ribbons at shows, ridden some fabulously well trained horses and trained or retrained several dozen. I don’t consider myself an expert. I’ve taught lifelong horse riders and owners how to use their bodies more safely and in balance with their horse, as well as to prepare for the unexpected, which you always expect around horses. Many of us have “just ridden” with no training and not much thought about it and done just fine. There’s always more to learn! Q: Can we do a longer ride? We LOVE horses. A: Riding horses uses more muscles than any other sport. Many of them are not used or stretched in the direction they are to ride, any other time. Even very fit people feel the odd pulls, knee twists, ankle stretching and core workout more than they expect. When we get tired, our response times slow and things get more difficult. 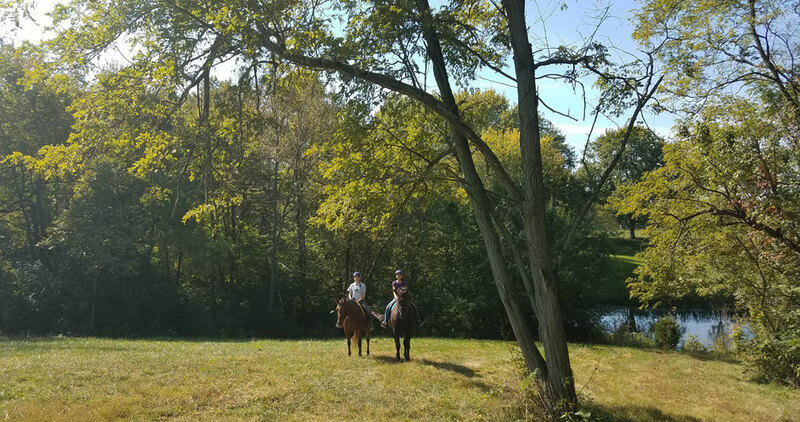 After years of observing, very few holiday riders are able to sit a horse for more than about an hour and a half, which is why we do the two-hour horse experience. Q: Can I wear my bike helmet? A: Sorry, helmets are made differently for different purposes. First Farm Inn has an assortment of helmets in various sizes for you to chose from. If you have your own riding helmet, you are welcome to bring it. A: Sorry, your dog may like horses, but my horses may not like your dog. It’s not worth risking an accident. 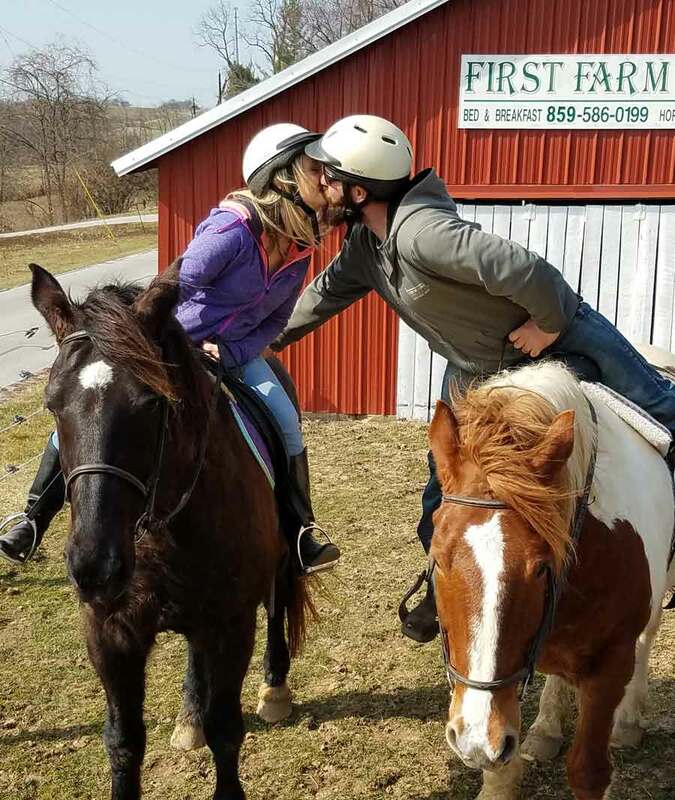 Q: Can we schedule a private ride, just for my girlfriend and I? She loves horses and I want to propose. A: Usually, yes. Planning is a good thing. However, if you’re focused on doing it tomorrow, it’s the middle of summer and I have the full day booked, it’s probably not going to work out. I am delighted to help creative lovers make unique memories. Some fantasies are a little beyond practical, but we can always come up with unique experiences. I’ve done a unicorn ride! Ask about the bunny, the diamond, the bubbly bottle and emergency surgery…. Call 859-586-0199 and see if we can make your dream come true!